Hi everyone and thank you for this forum. Really helpful. Maybe someone can assist me. Just recently bought a 1997 KZ1000 Police it’s stripped of several police accessories but still have others. Of course, no sirene and the hazard light relay is not included. I’m studying the wirings and the diagram to understand what’s missing. All the original police lights are not present and some wires were cut or removed. My question is related to fog lights. I bought the Chinese fog lights from Amazon to install on the bike. The pair of led fog lights that basically you connect the lights black wires to the frame and the red to the On/Off switch and the other wire to a hot wire. Having if desired a fuse and relay in between. The black/negative wire is connected to the bike frame so I did that in the front. To check I connected via by-pass to the battery and also an external battery. Worked fine. I don’t want to have to bring a wire from the battery to the front because of the work and also safety so I need to find a hot wire somewhere near the headlight. I checked all wires in the front that mostly are the ones going to the connectors and to the main connector. All wires even thought they work properly the only one that I found carries current is a white wire (see photo - white wire) connected to the main 6 pin connector that has only 4 wires connected to it. Once connected the lights work perfectly, but now comes the surprise. If the bike is off the fog lights work just fine. Once the bike is on, there’s no more current and the fog lights don’t work. I did basically connected the red wire of the fog lights to the white wire (hot wire) coming from the harness before the main connector. I checked all wires that I could find coming from the harness those that are connected to connectors and the other which were cut. No wire is generating any current with the bike on or not. All electric and lights work just fine with the exception of the hazard light which doesn’t have a relay and the sirene which was removed. I checked every wire using the fog lights and also the continuity with a multimeter as far as I could locate wires with the same color. No success. I can’t find any wire that works. I’m wondering why the white wire which provides power, is not working when the bike is on. I assume the wires and color still the same as the original diagram even though I can’t be certain but if there’s anyone with a KZ1000 Police that may have extra lights installed and know where should I look for the right wire I can use the help. Thank you!! I wired mine into the “pursuit “ switch. It’s got power even when the key is off. I wanted power completely separate from the rest of the bike. I’m not sure what color the wire was and that might not even relevant because I removed my fairing. Do you have the wiring diagram? Hi Jussumguy, thanks for replying to my post. I thought about it but I didn't pursuit that option I bought the Clymer Manuals for the KZ to find the solutions to all problems. I got the diagram from the manual and also from some posts/links placed here on the forum. I believe your tip maybe and hopefully is the solution for my problem. The diagram shows Red/White coming to the Pursuit Switch and Green/White going to the pursuit indicator. I'm not 100% when the pursuit switch is on the pursuit indicator light turns on, because I hope they didn't cut those wires from battery to the switch. I believe if pursuit indicator light turns on probably using that wire from the panel hopefully will give me the live wire. I'm afraid if pursuit indicator light is not working that means wires are cut or removed. At least based on the diagram the pursuit switch/wires don't have a relay is straight from battery/ignition/pursuit switch. I'll explore that option first thing in the morning and let you know what I find out. Hopefully works out as it did on your bike. Thanks again !! Quick update for future reference on the forum. 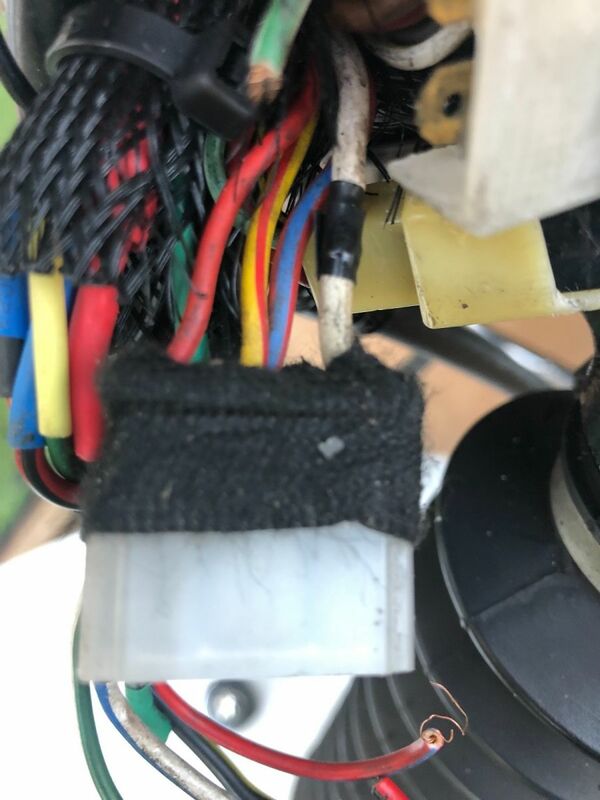 I didn't use the pursuit switch to connect the fog lights but I located a blue/white wire running from the battery to the front of the bike that used to be for the hazard light. I'm not planning to use the hazard at this point so I basically checked the wire and connecting to the battery provided power to the fog lights and stayed on. Now I'll work the wiring and place a relay in the circuit. Thank you for the help. Now comes the catch something happened or I did something and I lost the front brake tail brake light. the rear brake tail light is working properly. It's extremely weird as all wires look properly connected, no shorts, no fuse problem, the connection and tail light is working and I checked the continuity from the front brake all the way to the wire going to to the rear - tail light including the relay which I believe uses the turning signal relay. I'll post this on another topic maybe someone can help. Thanks.